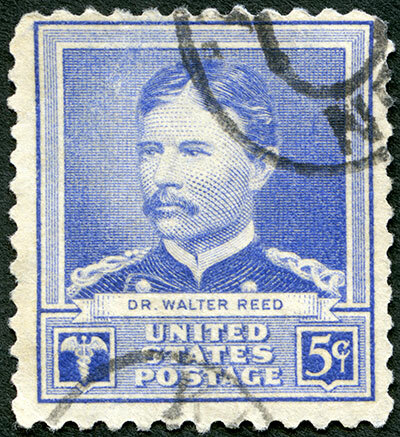 Major Walter Reed, M.D. whose name graces the Walter Reed National Military Medical Center (the largest military medical hospital in the United States) was born on this day in 1851. Reed is best known as the leader of a team that, in 1901, discovered that yellow fever was transmitted by a certain type of mosquito, instead of through human-to-human contact, which immediately boosted the then-emerging medical fields of epidemiology and biomedicine. Reed’s team’s findings also allowed the completion of the Panama Canal.